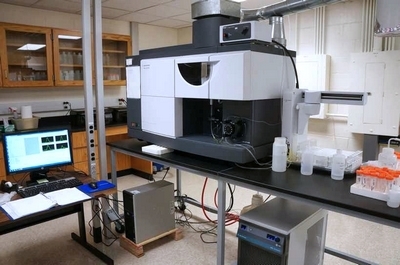 The Varian ICP-MS at the University of Houston is a Quadrupole mass spectrometer that utilizes an Inductively Coupled Plasma as an ionization source which then can analyze for the large number of trace element and isotopic abundances sequentially in a single method. Sample introduction is achieved directly in solution or by solid sampling with a laser ablation microprobe and sample delivery via carrier gas. The ICP-MS allows determination of elements with atomic mass ranges 7 to 250. This encompasses Li to U. Some masses are prohibited such as 40 due to the abundance of argon in the sample. Other blocked regions may include mass 80 (due to the argon dimer), and mass 56 (due to ArO), the latter of which greatly hinders Fe analysis. The Varian ICP-MS features: - A unique and patented interface/extraction optics to minimize interferences, providing reliable, routine, trace level quantification. 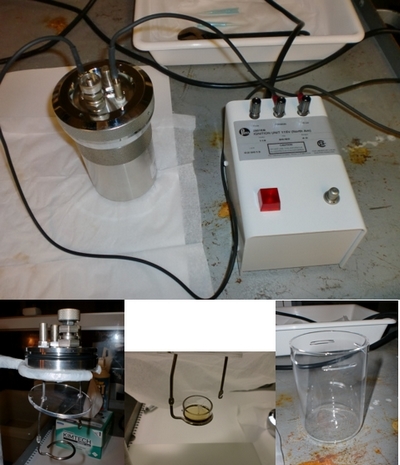 - An optimized sample introduction system, including a computer-controlled Peltier-cooled spray chamber, reduces interferences and improves stability. - A robust, high-efficiency plasma system and patented Turner Interlaced Coils break down the toughest sample matrices, reduce matrix effects, and minimize ion energy spread for maximum sensitivity and stability. - A patented 90 degree ion mirror and low noise double off-axis quadrupole provide industry leading sensitivity and background. -An all-digital extended range detector – more than nine decades of dynamic range in pulse counting (digital) mode. -The capability of analyzing up to 70 chemical elements in any sample that can be put into aqueous solution or can be mounted for laser ablation solid sampling. Detection limits and analytical precision vary with analytical protocol, instrumental response, blank contamination, interferences, matrix composition, and isotope abundance, but range from <100 ppb to <1 ppt (parts per trillion) in aqueous solution. Analytical relative deviation is typically <3%, one standard deviation. 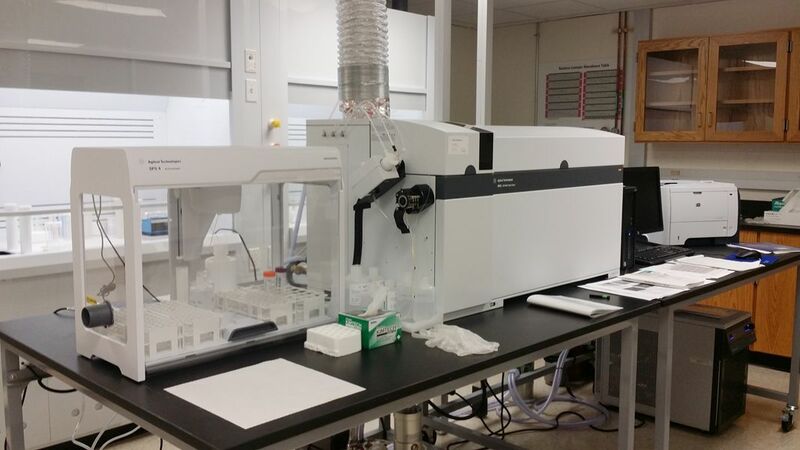 The Agilent 725 ICP-OES was delivered in 2013 is a compact as part of the Agilent-UH MOU Agreement. 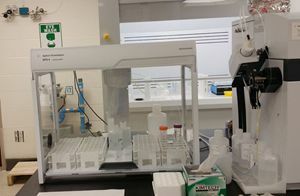 It is a bench-mounted simultaneous Inductively Coupled Plasma Optical Emission Spectrometers (ICP-OES) with full PC control of all instrument settings and compatible accessories. It features a custom-designed CCD detector with unique image mapping (I-MAP) technology, providing complete wavelength coverage from 167–785 nm. This simultaneous instrument will allow us to increase precision and accuracy of our major element measurements on rocks and fluids. The Agilent 725 Simultaneous ICP-OES offer the finest performance, speed and reliability in any such ICP technology. At the heart of this instruments is the next generation VistaChip II, a custom designed, hermetically sealed CCD detector, giving unrivalled productivity. With a range of performance enhancing options and a powerful software platform, the 725 meets demanding needs in elemental (major elements and trace element) analysis. Continuous wavelength coverage provides the ability to select multiple wavelengths for a given element, thereby extending dynamic range and avoiding interferences providing exceptional results. 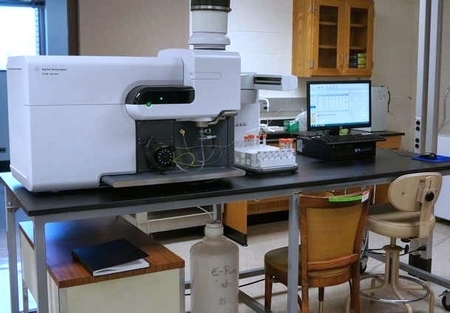 The Agilent 4200 MP-AES (Microwave Plasma-Atomic Emission Spectrometer) was installed in 2014. It is also suitable for major element rock and fluid measurements and minor and trace element abundances. It uses a nitrogen-based plasma generator that runs on air, and thus does not require flammable or expensive gases. Agilent 4200 MP-AES is cost efficient and has higher sensitivity with detection limits for elemental analysis down to sub ppb levels, speed that goes beyond flame Atomic Absorption (AA), and eliminates flammable and expensive gases. The revolutionary Agilent 4200 MP-AES runs on air rather than expensive argon and operates in tandem with an Agilent 4107 Nitrogen Generator. It is ideal for multielement squential analysis with applications in geochemistry, precious metals, mining, food and agricultural, manufacturing, chemicals and petrochemicals, and has superior detection of non-metals that are difficult for AA. It provides superior detection limits and vastly expanded calibration range that enable quick easy analysis at trace levels as well as eliminates the need for time consuming dilutions, e.g., of higher grade ore samples. The combined initial and operation costs are lower than ICP-OES and AA. Agilent 8800 is the first and only instrument of its kind. The new ICP-QQQMS system offers improved performance compared to single quadrupole ICP-MS, and provides MS/MS operation for controlled and consistent interference removal in reaction mode, a problem for conventional ICP-MS like the existing Varian 810 ICP-MS in the Lab. ICP-QQQ-MS also addresses high-end application requirements, with flexible analysis capabilities unavailable on single quadrupole machines. The unique QQQ configuration of the Agilent 8800 controls the ions that enter the collision/reaction cell, so the reaction conditions remain consistent and predictable even if the sample composition changes. The new instrument provides turnkey operation in a range of novel reaction modes, delivering effective and consistent interference removal for problematic elements in difficult samples that currently we can not analyze with high precision or at all. The Agilent 8800 can also be set up to operate like a single-quad ICP-MS, offering the security of replicating existing and familiar methodologies that we have currently developed in the lab for elements without significant interference problems. The Agilent's 8800 ICP-QQQ-MS is similar in ease of use of a standard ICP-MS, but provides better detection limits for phosphorus-containing and sulfur-containing compounds measured using QQQ-ICP-MS. The 8800 ICP-QQQ-MS analyzes problematic elements in samples across a range of applications, including:ultra-trace analysis of elements that suffer interferences in high-purity samples (Ge and As in HCl; V and Ti in H2SO4,and others). Reliable low-level measurement of selenium and arsenic in soil, rock and plant materials, where both polyatomic and doubly charged interferences may occur are possible. Quantitative analysis of sulfur and phosphorus in DNA and protein/peptides for life-science applications can also be determined. The Agilent 8800 ICP-QQQ-MS is revolutionary as a new form of ICP-MS instrument, offering maximum flexibility for high-end research and for solving difficult analytical problems. The next-generation, high-performance autosampler, SPS 4, is connected to 8800 to meet the needs of high-throughput, fast and high-capacity (up to 360 samples or 768 microtiter wells) analysis. The SPS 4 is especially suitable for ultra-trace analysis with the integrated environmental enclosure. The enclosure for the SPS 4 alos offers protection of laboratory environment from hazardous sample vapors. In addition, access to the power switch, peristaltic pump, and all electrical and communications ports are outside the environmental enclosure for easy access and protection from corrosion. 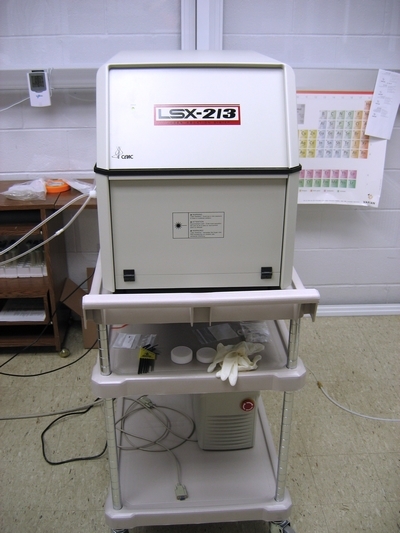 The LSX-213 has power output from the 5ns pulse width 213nm Nd:YAG laser coupled with sample viewing and illumination allow a direct interaction between analyst and analyte. 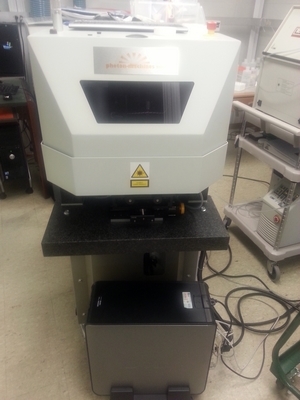 This Laser Ablation Sytem is routinely used for in-situ elemental elemental analysis. The 193 nm excimer is absorbed more readily in most materials than even 213 nm YAG, especially for those transparent mineral/material. Shorter wavelengths produce smaller particles on average that are transported to the torch and ionized more efficiently, resulting in less fractionation effects and better data. Heat, another source of fractionation, is trans ferred to the sample via direct conduction or the plasma shield that forms on the surface under certain conditions. Shorter pulse lengths yield less heat. The Analyte.193 utilizes the best of both, the shortest pulse length 193nm excimer laser for the best accuracy and precision, without the expense and cost of ownership of a UV femtosecond laser. 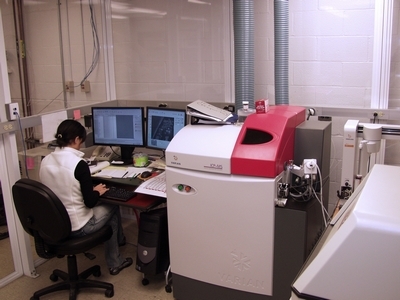 This laser is routinely used for zircon dating in combination with Varaian ICP-MS. 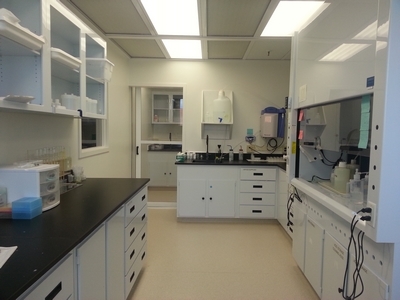 The Ultra-Clean Chemical Laboratory (UCCL) in room 317 of Science and Research Building I provides a reliable, contamination-free chemical treatment of samples prior to inorganic elemental or isotopic analysis. The concept is intended to guarantee a dust-free environment as well as resistance to corrosion even if hot concentrated mixtures of acids are continuously used, thus establishing not only a clean room but a clean laboratory. 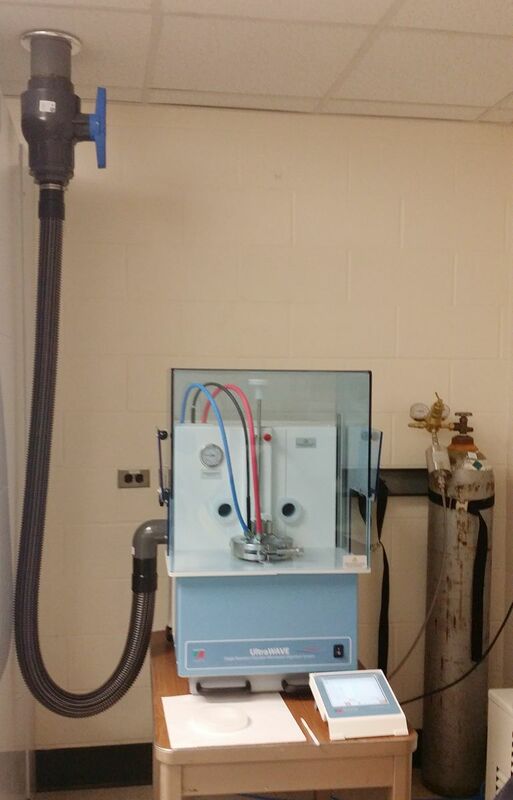 The excellent air quality is demonstrated both by particle measurements and the analysis of acids purified by sub-boiling distillation in the UCCL. The Milestone subCLEAN is a compact and easy-to-use sub-boiling system, where all parts in contact with acids are made of high-purity fluoropolymers. 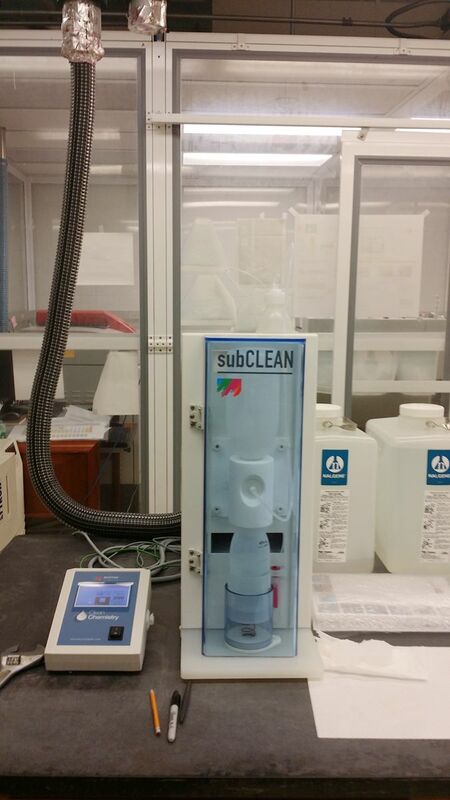 The subCLEAN is therefore suitable for the purification of HF, as well as for HNO3 and HCl. The fully programable heating protcol together with its precise temperature control make it supper easy to operate. The distillation rate is about 2 times faster than traditional two bottle distillation setup while can produce a superb clean acid due to its fully enclosed design. 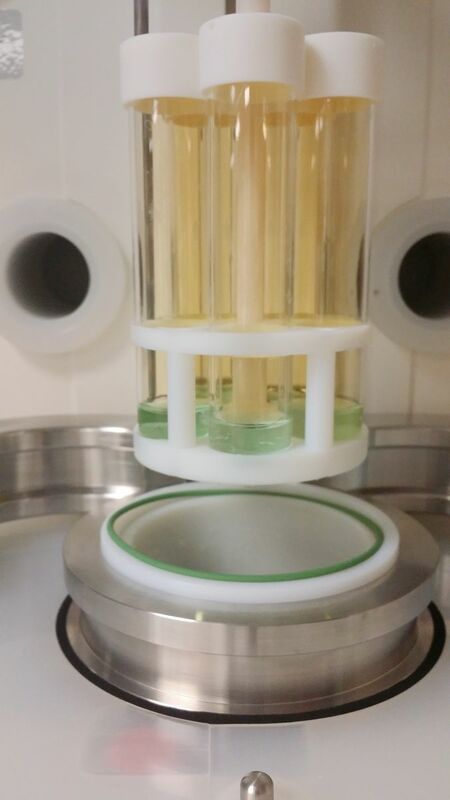 The 5 poistion rack with 40 mL quartz tube can treat up to 400 mg of crude oil or heavy organic matrix samples with mixed acids. The usuage of special stainless steel make the UltraWave capable to use HCl, which is essential to yield 100% recovery for some elements, for digestion of metal oxide and also for breaking down of insoluable floride. Complete digestion can be done in about 60 minutes. For larger sample size a 4 position rack can be used. For silicate or other inorganic materials sample tube made of TFM can be used to obtain ultralow blank. The 15 poistion rack with 15 mL quartz tube can treat up to 200 mg of crude oil or heavy organic matrix samples with mixed acids. Silicate rocks/inorganic powdered materials are completed digested in TFM tubes. our test on USGS reference materials indicated that the UltraWave is capable to digest all kinds geological materials including those with high abundance zircon or oxide and/or refractory minerals. 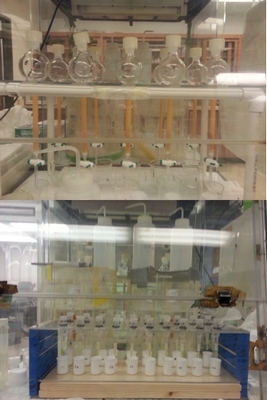 A 22 position rack with 7 mL TFM tube can be used for small samples such as single zircon to get supper low blank together with high-throughput. 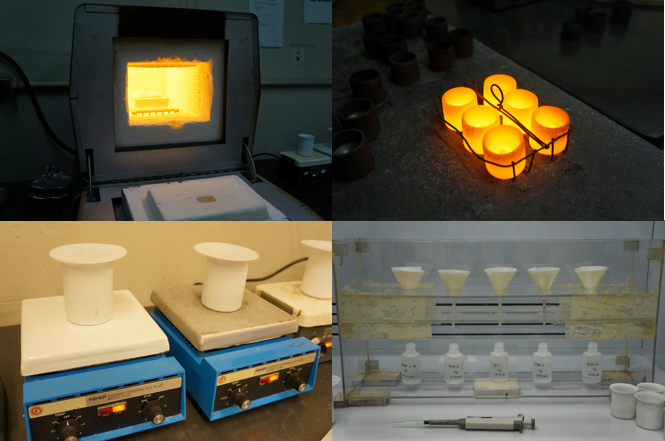 The Fusion Lab located in room 6 and room 61 is equiped with a Lindberg Muffle Furnace that heat up to 1300 celsius degree. The fusion tech assited with lithium metaborate flux is used to prepare solutions for ICP-OES analysis for silicate rocks and minerals. Parr High T and High P Acid Digestion bombs are used to for both inorganic and organic material. 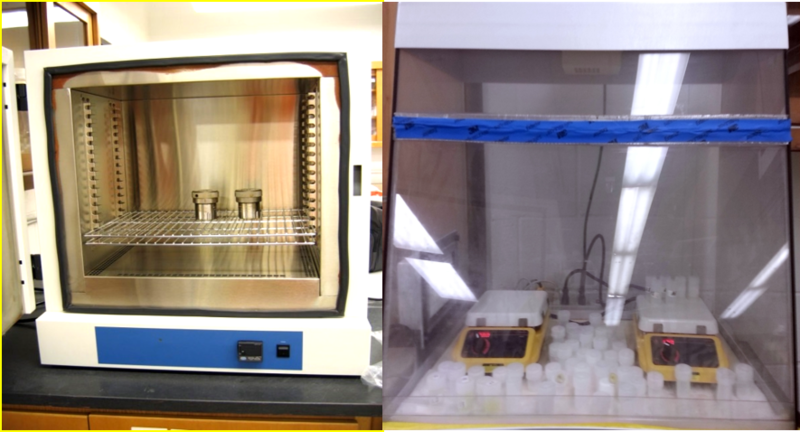 The Hot Plate inside a clean-air vented hood is used for sample digestion and sample solution drying down. Parr Oxygen Bomb provide the ability to analyze heavy organic matrix samples that are difficult to be digested and/or insoluble to organic solvent. The combustion procedure is conducted inside a Covered Quartz Liner to prevent sample loss. 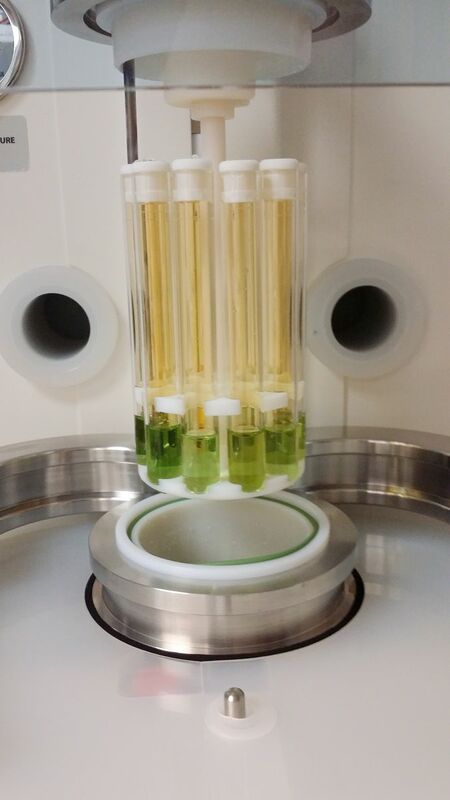 Lithium and Vanadium are purified with Cation and Anion Exchange Columns for isotope analysis with Nu Plasma MC-ICP-MS.